» View the full list of member benefits or join CAI as a Manager member. As an added benefit of membership, individual manager members automatically are enrolled in CAI’s Association of Professional Community Managers (APCM). Through this specialized member group, you can learn from your peers, share your own expertise, and access tools, resources and information that can make you a more effective and respected manager. CAI-NJ has a committee comprised solely of Community managers and Management Company CEOs. This committee meets quarterly, promotes the importance of CAI membership, writes a monthly Management Trends column for Community Trends, makes suggestions for future Professional Management Development Program (PMDP) courses and recognizes new programs and initiatives for Manager members. If you are a Manager or Management Company member of CAI-NJ and are interested in serving on the Managers Committee, contact the chapter office at (609) 588-0030. The Manager Minute is a new resource for CAI-NJ manager members. It is a short video containing valuable information and facts from the Managers Committee. CLICK HERE TO VIEW THE MARCH MANAGERS MINUTE. Community managers are essential to the communities they serve. 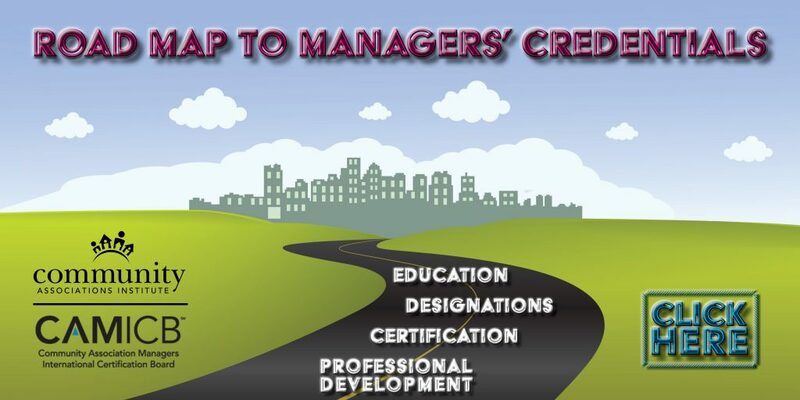 The most important thing they can do to accelerate their careers is to receive training and credentials from CAI’s Professional Management Development Program (PMDP). Watch Mike the Manager on his journey to earn his CMCA, and learn how you can do the same!